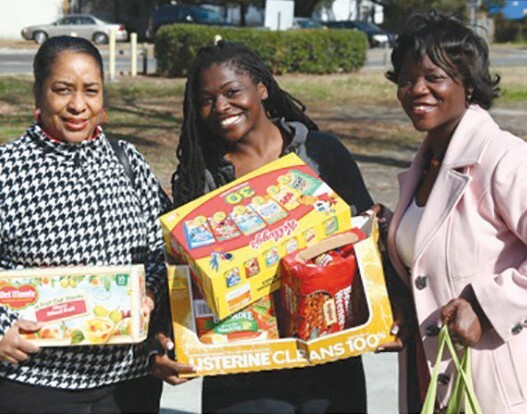 In recognition of National Canned Food Month, Alpha Kappa Alpha Sorority, Incorporated, Gamma Sigma Omega Chapter presented canned and packaged foods to the Blessings in a Book Bag program at Otis Brock III Middle School (formerly Bartow) on February 14, 2014. Blessings in a Book Bag Inc., founded by Mahogany Bowers, is a community program which seeks to ensure that children who qualify for free or reduced lunches will not go without food on the weekends. Every weekend food is distributed at the middle school and placed in the children’s backpacks. Gamma Sigma Omega is continuously reminded by the Chapter president, Tarangula Barnes Scott of the importance of making an impact in the Savannah-Chatham community.